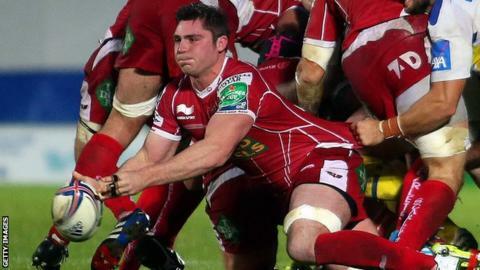 Scarlets captain Rob McCusker and winger Kristian Phillips have signed new deals to stay at the Welsh region. McCusker, 28 and Phillips, 23, were both due to be out of contract at the end of the season. Scarlets head coach Simon Easterby said he is pleased to have secured the pair's services. "We are delighted to have retained both Rob and Kris on extended contracts here at Parc y Scarlets to maintain balance and experience in our squad," he said. "Rob has led the team with spirit this season and is a true Scarlet in terms of his values and commitment to our squad, the region as a whole and our supporters. "He has worked hard to get his opportunities with the Scarlets over recent years and has taken to leadership and the responsibility of captaining the squad well. "Kristian has settled in well since joining us a few years back and has made the most of the opportunities handed to him here at Parc y Scarlets. "He's reignited his spirit for the game, shown a good work ethic, ambition and enthusiasm and has bought into our Scarlets values and goals as a team. "He's still a young talent and offers real attacking options in the back-three." McCusker, from Wrexham, began his playing career with Mold RFC. Since making his debut for the Scarlets in August 2007 against Exeter Chiefs, he has been won six Welsh caps. "I'm happy to be staying at the Scarlets," said McCusker. "My heart is in the Scarlets region and at home in Llanelli and I feel I still have unfinished business here, particularly after being handed the privilege of being captain. "There's no doubt we are building a great team and I wanted to continue to be a part of that." Kristian Phillips, is also happy to be staying at Parc y Scarlets. "The opportunities I've had so far here with the Scarlets has really brought me on again and I'm delighted to have the chance to extend my stay at the region," he said. "It's been down to me to do my best on the pitch and I'm working day in day out on technical aspects of my game to improve."